If you have been following this blog, you know I have been running a series of posts titled, Ten mistakes a reader never misses. In these posts, I have highlighted the common and easy mistakes a writer can make when completing a manuscript. That’s why having an editor review your work is so critical. You can find all previous blog posts by simply typing the word, “mistake” in the search box. It will bring up all the previous blog posts. To see what you have learned, read the next two paragraphs and see how many mistakes you can find. There are actually 65 errors and the answer key is included at the bottom of this post, but try to find them all before you look at the key. Then let me know how you did by leaving a comment. Today, Shelley decides to stop by her all too familiar local bookseller. You see Shelly is a avid reader that enjoys a lot of different books. Not to mention reading quiet a bit, accept on week days. Walking down the isles, many books peek her interest. She spots very unique covers which get her attention, irregardless of their subject.After awhile, she gets to the point where she must chose between three books. One looks best. Reading the back cover, she fl ips to the about the author. Every thing looks great. But, before she brings it to the counter, she starts to read the forward. Mark is not at all adverse to shopping on-line. In fact he finds there’s no where he likes to shop more then from one website. Everyday after work he has proven so astute with his favorite internet book store. Its an all together good experience especially when he can browse in his PJ’s or work-out cloths on. Graphics and snap shots effect his choice. Th ey wet his appetite and help him hone the right book. 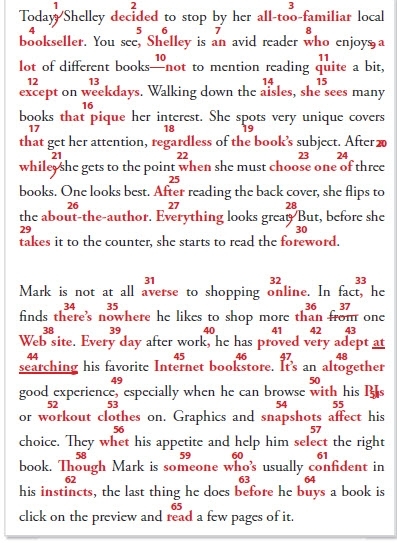 While Mark is some one whose usually confidant in his instinct, the last thing he does when he bys a book is click on the preview and red a few pages of it. Did you find all 65? Here’s the answer key to help you see what errors you missed. → The publishing journey of Annie Downs: From self publishing to traditional contract. Ahhhh, finally the answers! Remember when you first posted this, I responded saying that I only had one error – and wasn’t able to find it? Well, it was the word, “Internet” – I did not realize that it had to be capitalized. That was my error. I’m so glad to finally know what it was, because it’s been driving me crazy! LOL. It took a while to get through the series because there were other posts I wanted to do. I am glad you enjoyed it. My friends need to see this post, at least. Thanks!